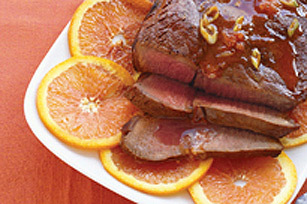 You'll be wowed by the citrus flavour of this succulent steak dish. Mix dressing, orange peel, orange juice, onions, pepper and garlic powder in large shallow dish until well blended. Remove 1/4 cup of the dressing mixture; set aside for later use. Add steak to remaining dressing mixture; turn to evenly coat both sides. Refrigerate at least 1 hour to marinate. Preheat broiler. Drain steak; discard marinade. Place steak on rack of broiler pan. Broil, 2 to 3 inches from heat source, 8 min. on each side for medium doneness (160°F). Cut steak into 8 pieces. Serve with reserved 1/4 cup dressing mixture. Orange also pairs well with ginger. Try 2 Tbsp. grated fresh ginger root instead of the garlic powder.